Common blue violet is found throughout eastern North America. Common blue violet is a low-growing, colony forming perennial. It spreads by seed or short, stout rhizomes. It flowers from April through June. Common blue violet is a common weed of turf and landscapes. It is also found in meadows, woods, and roadsides. Though it thrives in cool, moist, shady conditions but will also tolerate drought conditions. Common blue violet has smooth green heart-shaped leaves. The leaves arise from a crown at the soil surface on fairly long (twice the length of the leaf blade) petioles. The roots arise from a thick, knobby, short rhizome which fractures easily. The flowers are usually deep purple or blue, but may also be gray, white, or light violet. The flower has 5 petals and the 2 lateral petals are bearded. Flowers arise on leafless stalks. The fruits are capsules with 3 lobes and contain brown seeds when ripened. Blue violet is one of the most challenging lawn weeds control culturally. Hand pulling of weeds is possible for small infestations but care should be taken to remove the entire rhizome which tends to break easily. In high cut lawns, (3-3.5 inches) blue violet is less noticeable after flowering and may be tolerated when populations are low. Maintaining a dense, healthy and vigorous lawn is the best method for reducing rates of infestation and spread. 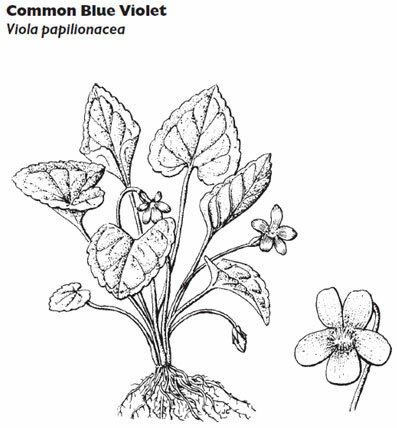 Common blue violet can be controlled chemically with spring or fall applications of several two- and three-way combination herbicides, particularly those containing triclopyr. The turfgrass area should not be mowed for two to three days before and after herbicide application. The treatment application should be done at a time when there is no rainfall expected for at least 12 hours.